Have you ever wondered how is it possible to have a “floor” on price on any goods? In the scenario of Thai rice, when PM Yingluck Shinwatra (now facing trial) took over powers in Thailand 2011 General Election, one of her populist votes is to offer rice farmers income protection. How is income protection related to price floor? 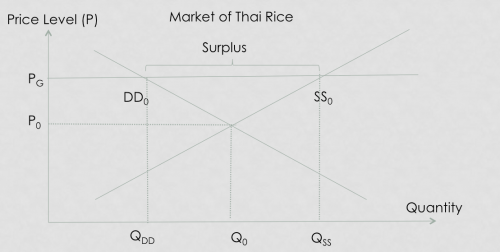 So initially, supposing the Demand and Supply of Thai Rice is at equilibrium at P0 and Q0. The Thai government announced that a price floor of PG will be imposed on top of P0. The price floor artificially raised price of rice from $271/ton (P0) in July 2011 to $500/ton (PG) in September 2011. At PG, there will be a surplus of rice where quantity supplied by thai farmers is greater than quantity demanded by Thai consumers / the rest of world. The surplus of rice will then be purchased by the Thai Government at inflated PG, thus, providing an implicit income guarantee and subsidy for rice farmers. How does it impact Thai Economy? Strained on fiscal budget – if the Thai Government could no longer channel resources from other sectors, it will have to deep into its own coffers to provide this “price guarantee” to rice farmers, further worsening its fiscal position for rainy days. From this example, we can see that politics and economics are closely related. In order to win votes, there are many tools available to a politician to use, and price floor is not necessary one of them. However, not every tools politicians use are of the best interest of the economy! 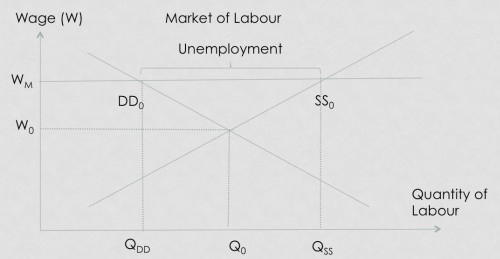 From QDD to Q0, employers (who form the demand for the labourers) will cut back on employment due to higher business cost. From Q0 to QSS, more workers would be attracted into the job market due to higher wages at Wm. 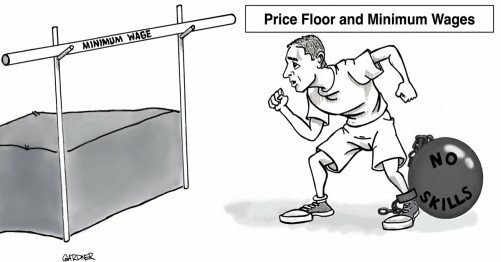 Wage push inflation – Higher labour cost will normally translate into higher cost push inflation in an economy. In my classes, I will be regularly referring to real life examples to relate to complicated diagrams like this. If you find this article interesting and easy to digest, please consider my regular classes and let me help you to score your A in Econs!